Hawks Pride aims to provide an inclusive LGBTIQ supporter group that welcomes and embraces all members of the community. The group will host regular social events, watch games together and connect with the club. The group was created by three die-hard Hawthorn Football Club fans in 2017. The group welcomes members from diverse sexuality, gender and cultural backgrounds. Hawks Pride will join with similar groups at other AFL clubs to form a collective organisation to represent LGBTIQ AFL supporters. Established in 2007, the Law Hawks are the Official In-House Lawyers’ Supporter Group of the Hawthorn Football Club. The Law Hawks comprises passionate Hawthorn supporters involved in all areas of the legal profession. The Law Hawks enables lawyers, their staff and others to interact and network through their common love of football and shared passion for the mighty Hawks. It also gives them the opportunity to entertain guests and clients in a relaxed setting. Representatives of the Law Hawks include barristers, solicitors, corporate and academic lawyers, members of the judiciary, law students, members of the police force, legal executives, legal secretaries and others engaged in the legal profession. For the past two seasons the Law Hawks have been the official sponsor of star defender Josh “Gibbo” Gibson. Through this sponsorship we have great access to Josh, who attends and hosts all of our functions, and provides personalised memorabilia exclusively for the coterie. In addition to these functions the Law Hawks also host annual tipping and supercoach competitions along with raffles and quizzes with the winners of these receiving autographed memorabilia and ‘money can’t buy’ experiences with the Club on game day. You don't have to be legally qualified to join the Law Hawks although you do need to be connected with the legal profession. We now have over 200 members, and these numbers continue to grow each season. How can you keep up-to-date? Follow the Law Hawks on twitter and/or LinkedIn for easy access to all the latest information. We also update members by e-mail throughout the season. The Hawkers, comprised of social club members, commenced their monthly lunches at the Glenferrie Social Club. At each lunch a special guest speaker was invited to entertain members and their guests. Unfortunately Paul Keating came down on tax-claiming luncheons in 1987 which slowed the Hawkers somewhat until the format was re-started in the early 1990s. With the closure of the social club, the Hawkers transferred to Hawthorn Receptions and now have moved to the Pavilion at the Box Hill Football ground. The Hawkers meet at the Pavilion Box Hill on the first Friday of each month, and all football supporters are welcome. You can register as a Hawker and receive a monthly initiation by contacting Jas on 0413 685 495. 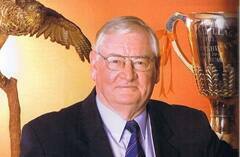 The Luncheons are hosted by 1961 Premiership Captain Graham Arthur. On the first Friday of each month, they meet for lunch, hosted by 1961 Premiership Captain Graham Arthur, at the Pavilion Box Hill City Oval. Please contact Jasminka for bookings on 0413 685 495 and also register as a Hawker and receive a monthly invitation. Join Graham Arthur and past players along with like minded Hawks members for dinner. Get up close and personal with special guest interviews and more. Held at the Glenferrie Hotel on the 3rd Thursday of each month. Bookings are essential, contact Jasminka on 0413 685 495 for further information and bookings. The Thornbirds have been in existence for over 37 years and is a group of female Hawthorn FC members, supporters and friends. You do not have to be an HFC member to become a Thornbird! We run various social and fundraising activities during the year – day, night, and weekends where possible so everyone is able to join us during the year. The Thornbirds have a Glenferrie Gold membership with the Hawthorn museum; our own paver is under the John Kennedy statue and will do any other donating or fundraising as required by the club. We raise funds for the football club through our sponsorship of three senior players – Jack Gunston, Marc Pittonet and Ricky Henderson - and two VFLW players - Sarah Perkins and Rosie Dillon. Also we support many worthwhile charities such as the Good Friday Appeal, Ovarian Cancer, Cancer Council and many others. Contributions to charities as the needs occur. If you would like to join us please complete the attached membership form - $35 is the annual fee which includes discount to our functions, regular newsletters and other benefits. You do not have to be a member to attend our activities but members do receive a discounted rate to attend functions. Please feel free to join us at 10.15am - $10 for coffee and cake in a relaxed atmosphere.